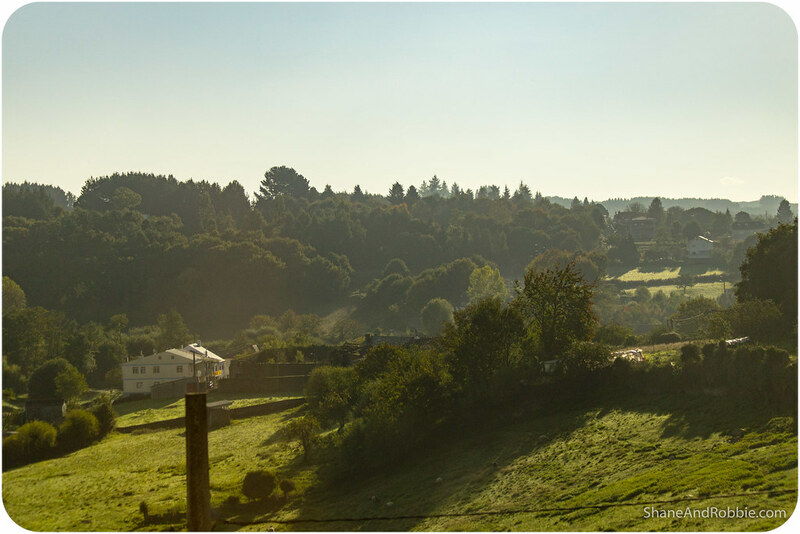 The closer we got to Santiago de Compostela, the prettier the scenery became and the more pilgrims we could see on the trail. 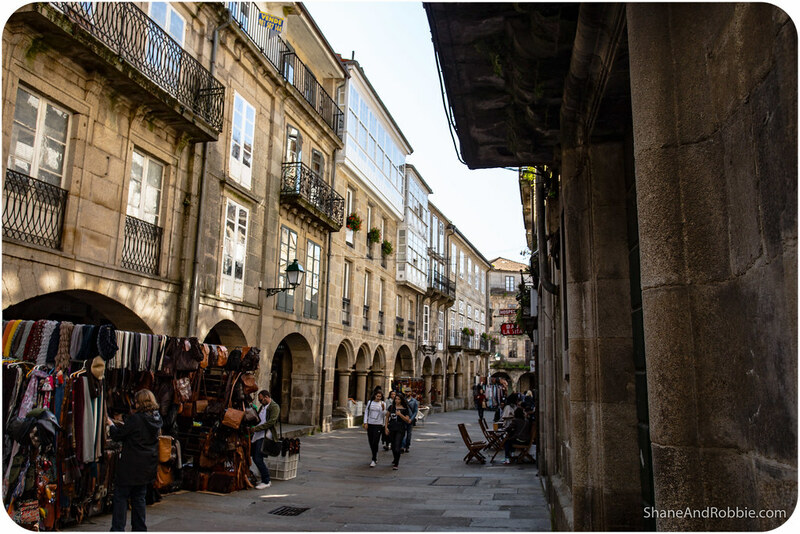 Like colourful beads strung out along the track, there were dozens of them making their way into the city, traditionally the final destination of the Camino de Santiago. 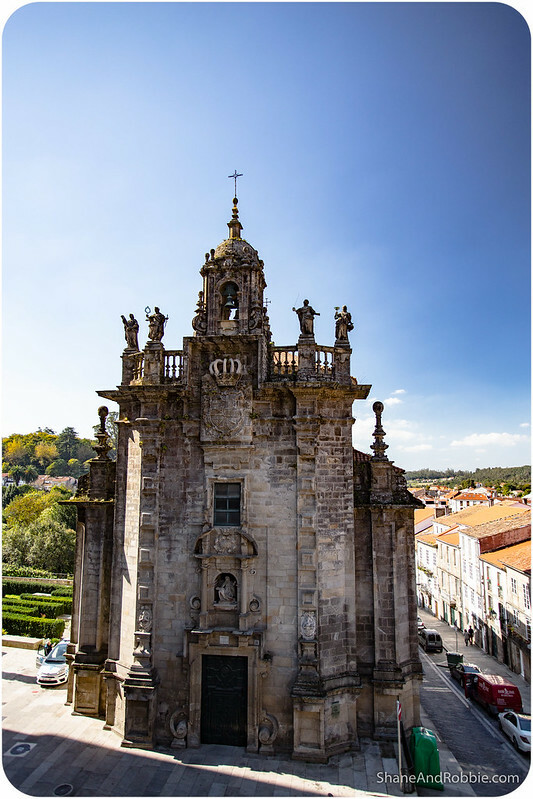 The number of hikers in town was quite startling too; many of the pilgrims were camped out in the main square, staring up at the grand cathedral where St James’ remains are supposedly kept, their faces lit with elation at having completed their Camino. There’s an infectious buzz in the air too that we can only attribute to all the pilgrims – this is the liveliest town we’ve been in for a while, that’s for sure! 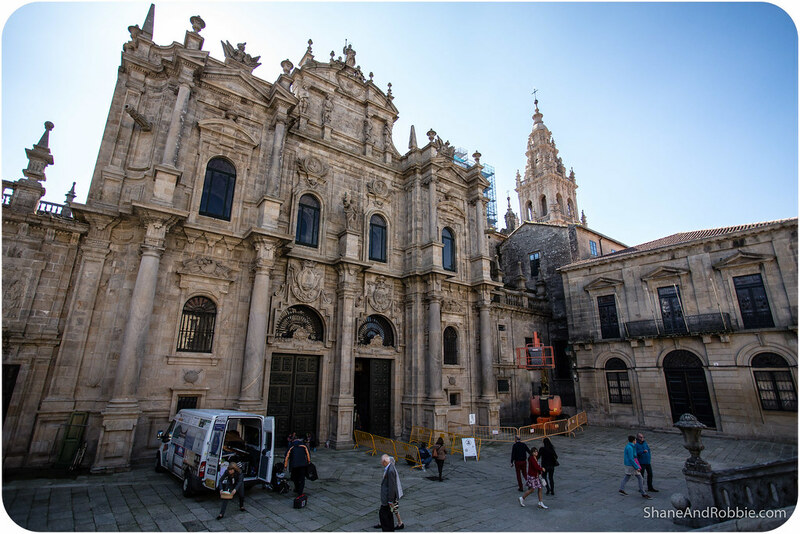 It’s also one of the more magnificent cities we’ve been in for a while; there are so many grand buildings in town that give testament to Santiago de Compostela’s historical importance and wealth. We’ve given up on Spanish trains entirely, so our day started with yet another bus ride through the Spanish countryside. It was cold this morning when we boarded the bus at 8:45am*, our breath steaming in front of our faces. The sky was beautifully clear and yesterday’s clouds had all but dissipated. 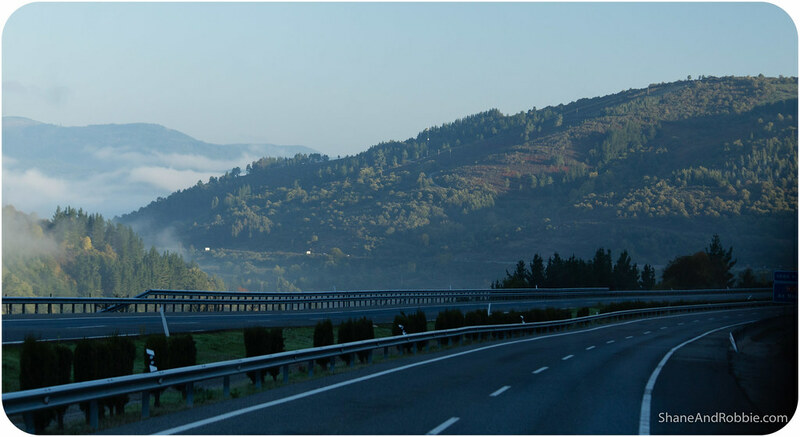 There was just a bit of morning mist clinging to the hillsides and valleys as we drove out of Ponferrada. *Which is ridiculously early by Spanish standards, especially given that sunrise is at 8:30am at the moment. Being so far West the late starts make a lot of sense! 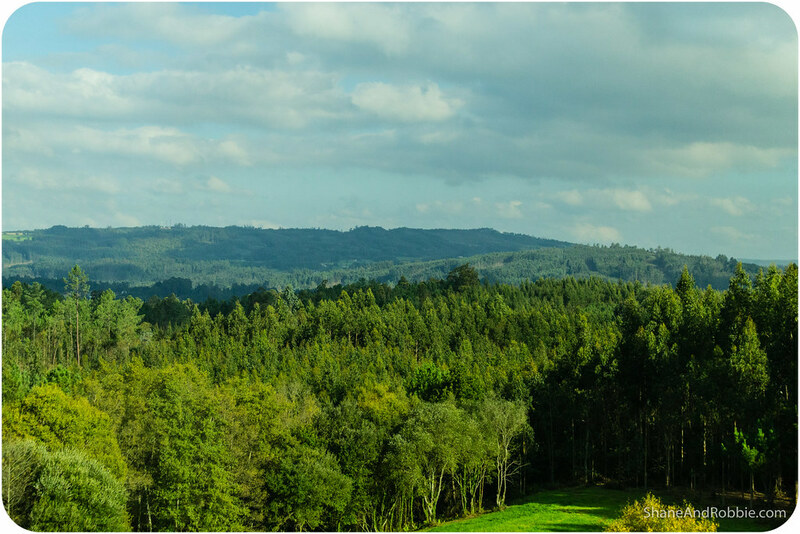 Climbing out of the Bierzo Valley we crossed into the green hills of Galicia, another of Spain’s semi-autonomous regions with a fierce sense of independence. 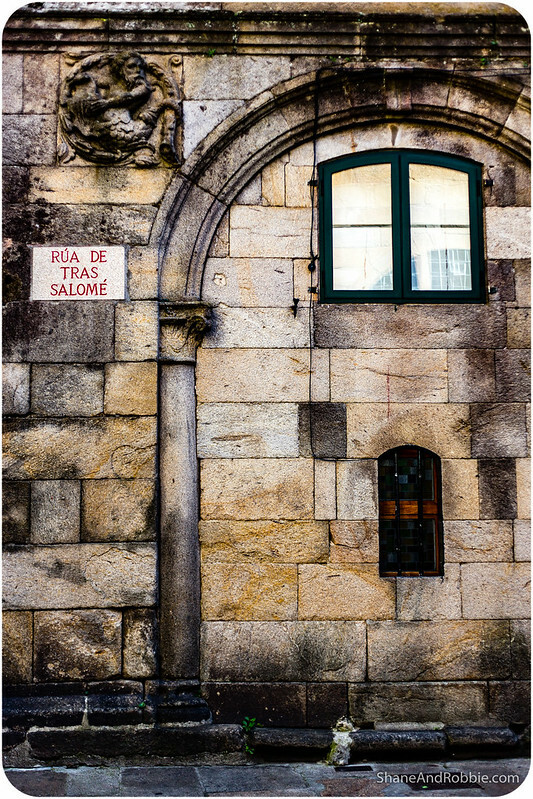 Named by the Romans for the Gallaeci (the Celtic tribe that was living here when they conquered this part of Spain), Galicia has its own language, a proud Celtic culture, and weather to match. It’s also incredibly green here thanks to rains brought by the Atlantic Gulf Stream. 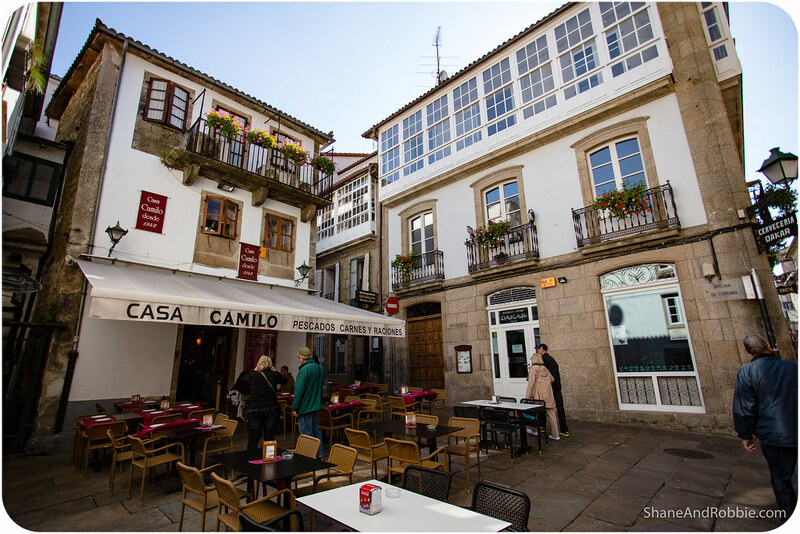 We’ve noticed too that the locals in Santiago de Compostela speak Castilian Spanish with a slight lilt, since Gallego, the region’s other official language, is flowing and musical – closer to Portuguese than Spanish. 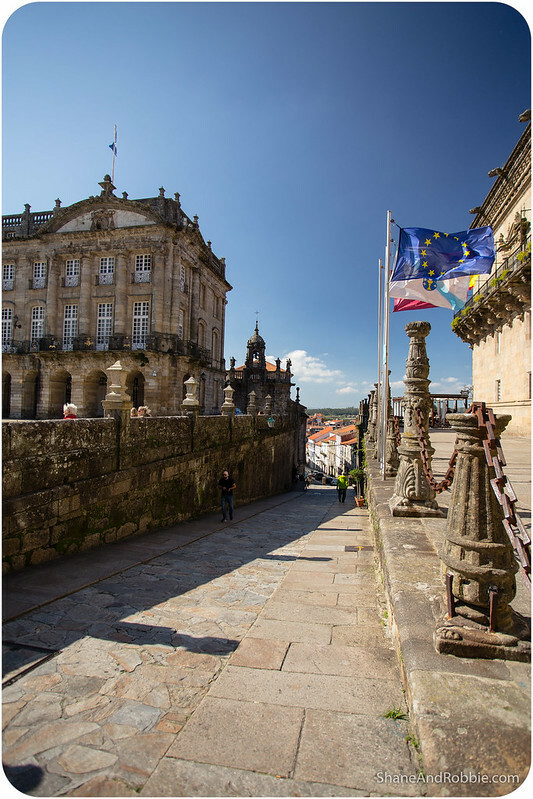 Santiago de Compostela is the capital of Galicia and, as the final destination of the pilgrimage following the Way of St James, a prosperous town steeped in history and tradition. 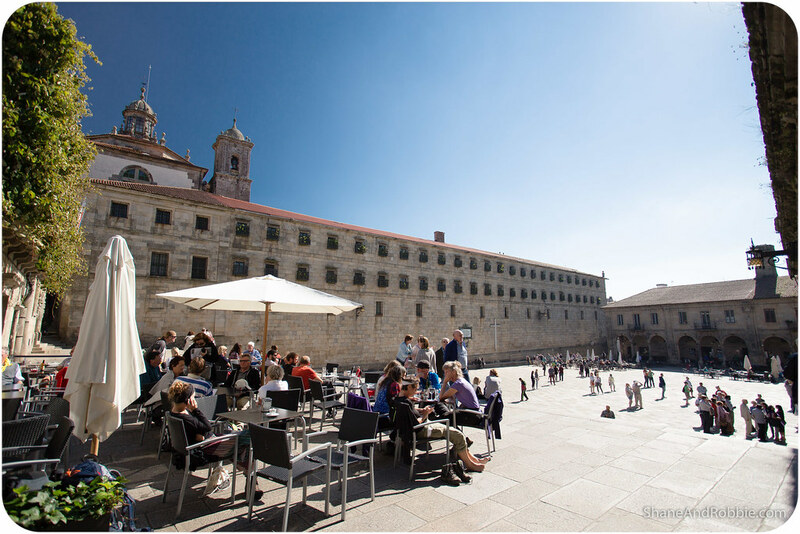 We could see this as soon as we arrived this afternoon – the cobbled streets of the old town wind their way around a seemingly endless parade of churches and grand ecclesiastical buildings the likes of which you would expect to see in a much larger town (Santiago de Compostela only as a population of about 80,000). 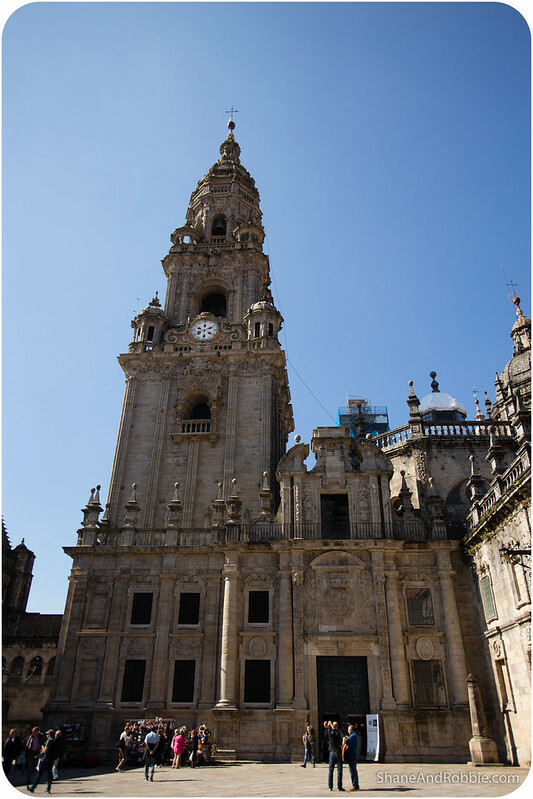 The city grew around the shrine of St James, now housed within the city’s cathedral. 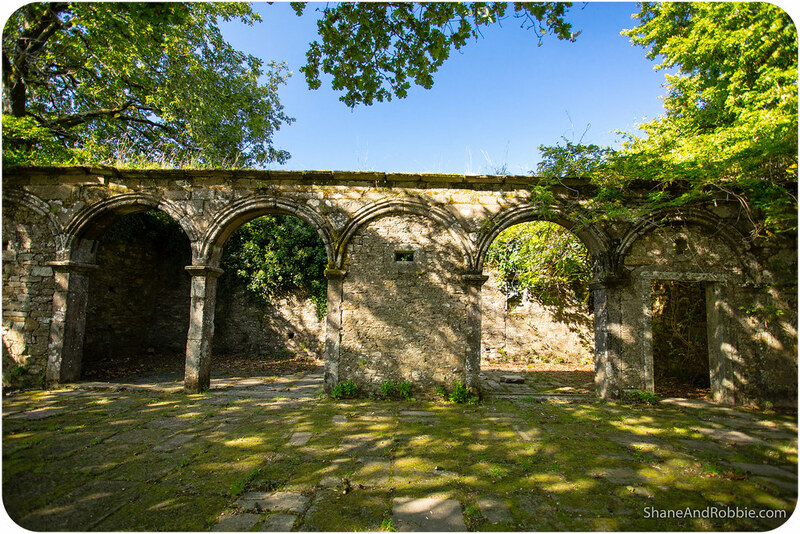 Legend has it that, in 813 a hermit called Pelagius saw a mysterious light shining over a Roman tomb forgotten in the middle of a forest. 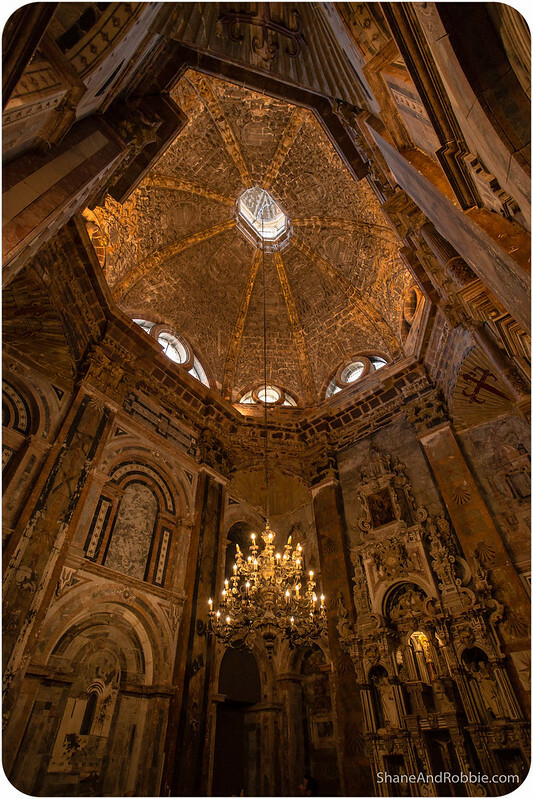 Very soon, the incredible news spread all over the Christian world: the tomb of St James, apostle of Jesus Christ, had been discovered near the end of the known Earth, in the North-West of Iberian Peninsula. 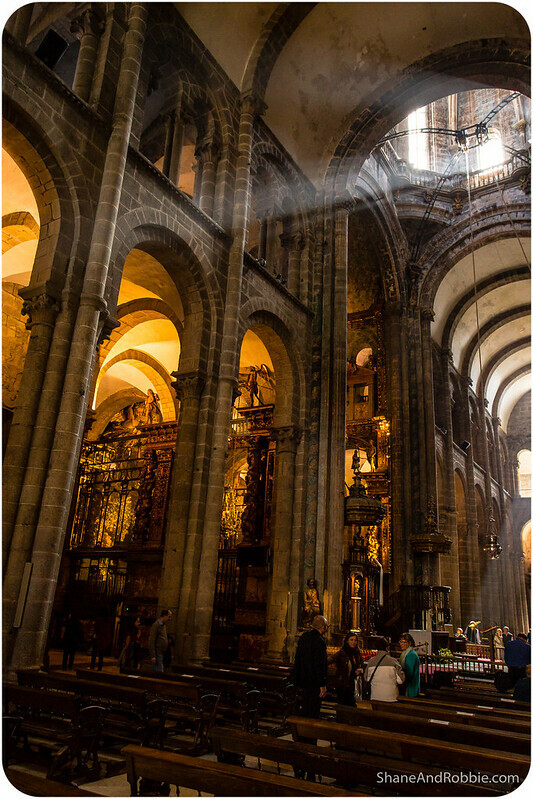 A few years later, this site became a famous pilgrimage town, one of the most important of Christianity. 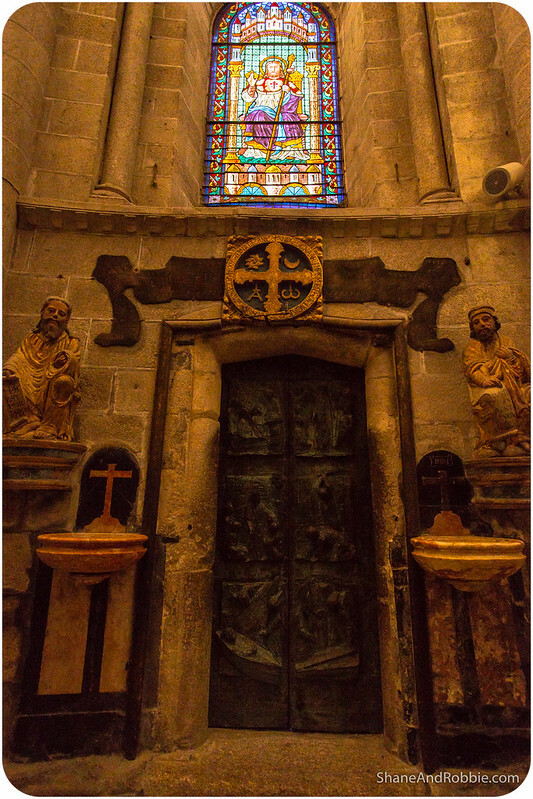 Pilgrims came from all over Europe following the Camino de Santiago to reach the city born around St James’ tomb. 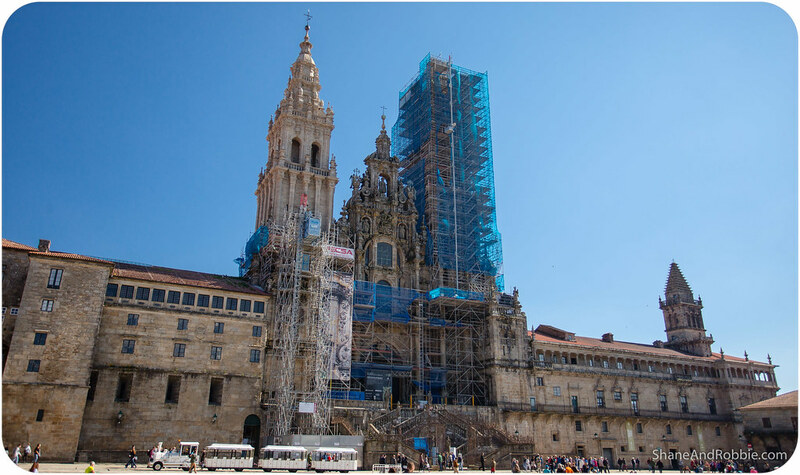 Destroyed by the Muslims at the end of the 10th century, Santiago de Compostela was completely rebuilt in the following century and its cathedral became a symbol of the resistance of Medieval Christians against Islamic influence in the Iberian Peninsula. The beautiful cathedral was our first stop today, though we were a little disappointed to see the exterior mostly encased in scaffolding and blue netting due to renovations. 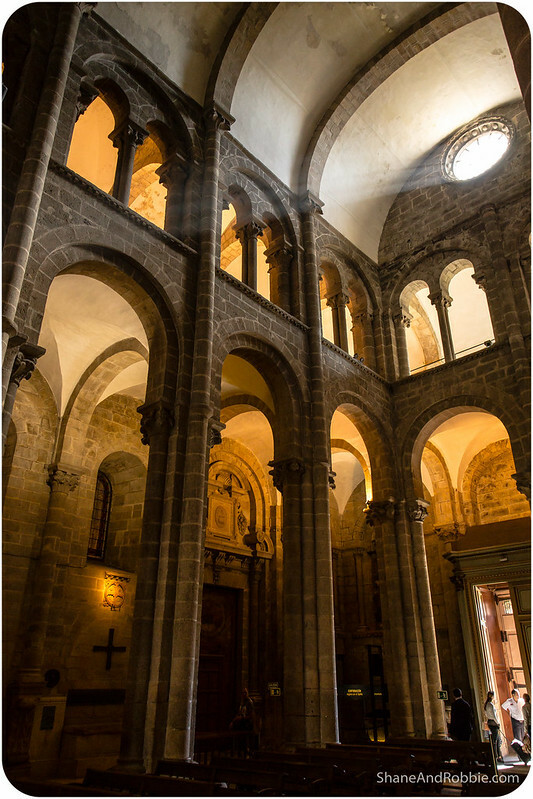 The interior, at least, was free of visual encumbrances and we happily spent an hour or so exploring the various chapels and naves. We forwent the queue to go down into the basement and kiss the casing that holds the remains of St James, focussing our efforts on the church itself. 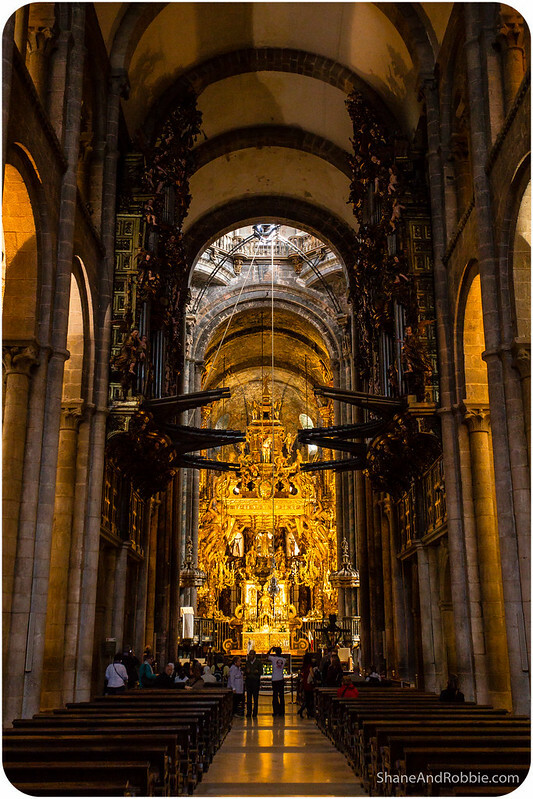 The proportions inside the cathedral were vast, especially the towering central arches and golden, Baroque high altar piece. 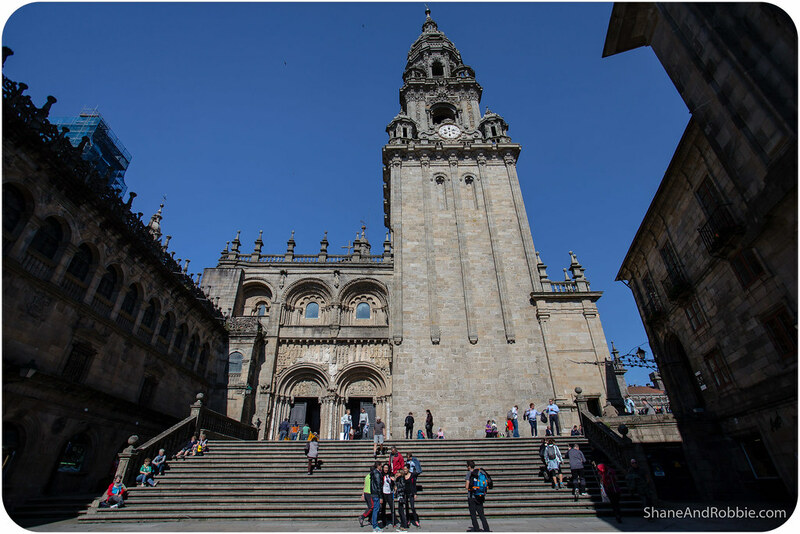 The cathedral faces into the central square, Praza do Obradoiro. 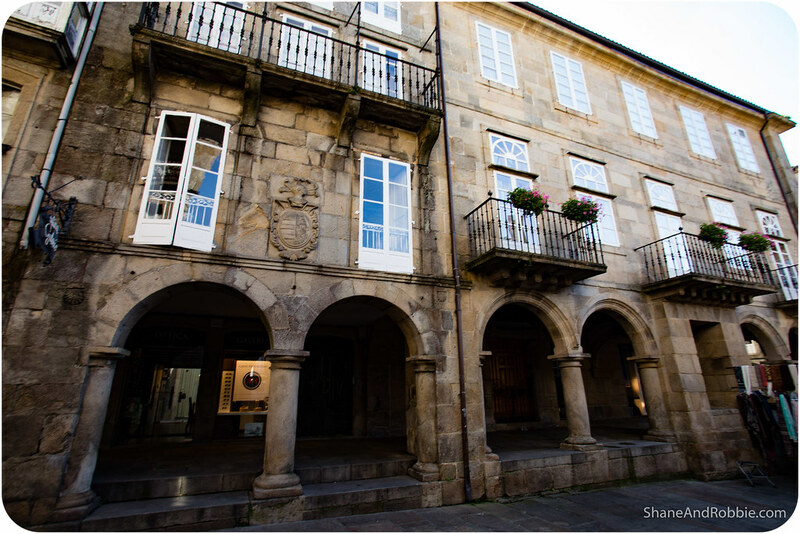 Along the Western side of the square we saw the elegant 18th century Pazo de Raxoi, now the city hall. 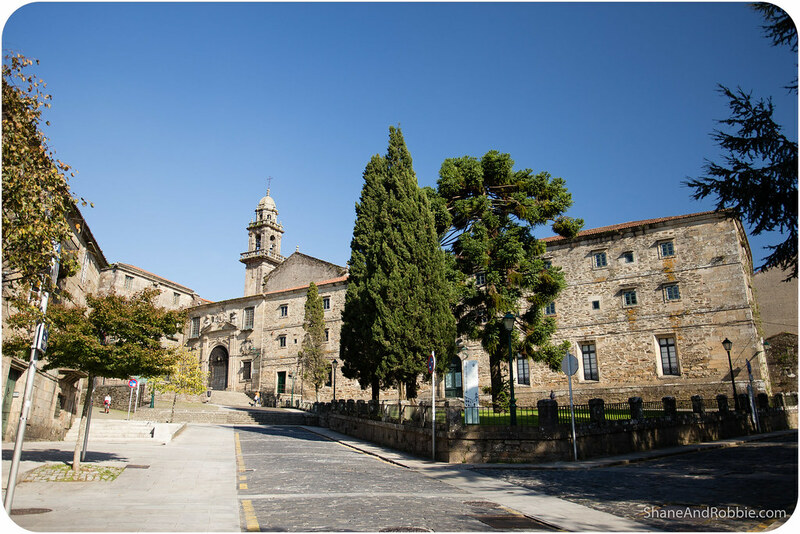 And across the square we got to admire the Hostal dos Reis Católicos, founded in 1492 by the Catholic monarchs, Isabella of Castille and Ferdinand II of Aragon, as a pilgrims’ hospice. 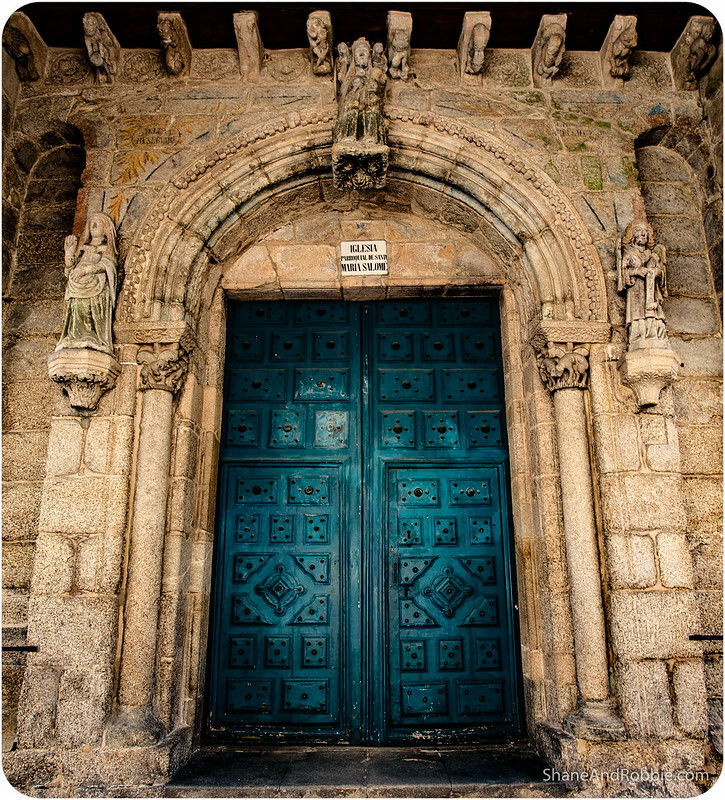 We only got to admire the Hostal dos Reis Católicos from the outside however, as it is today a parador (i.e. 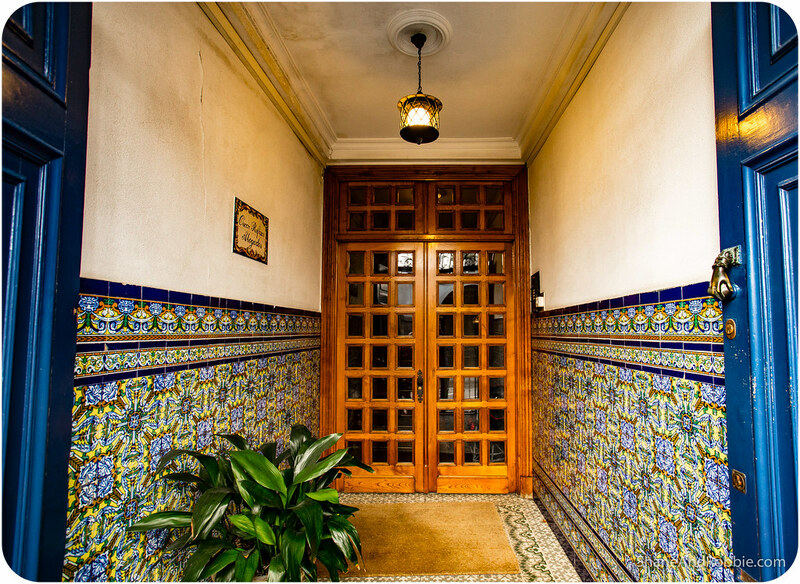 a state-run luxury hotel) and the beautiful interior is off limits to non-guests. 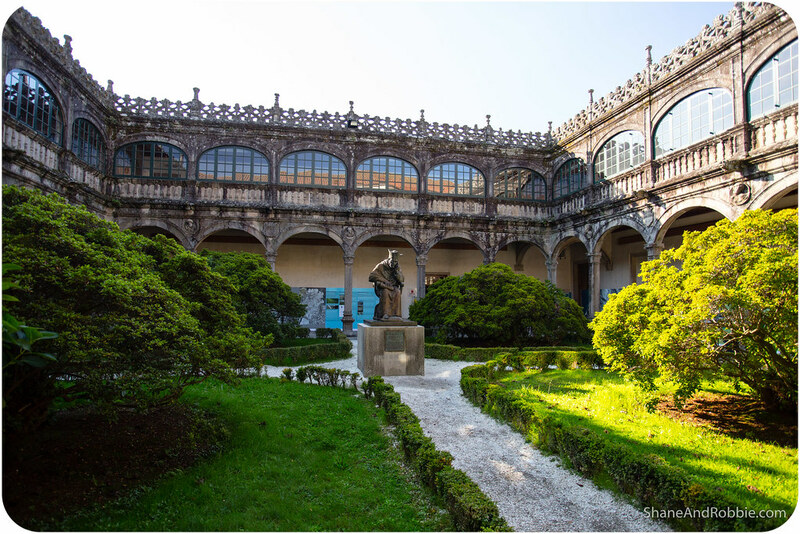 We at least DID get to see the inside of the Colegio de San Jerónimo, which makes up the fourth side of the main square. 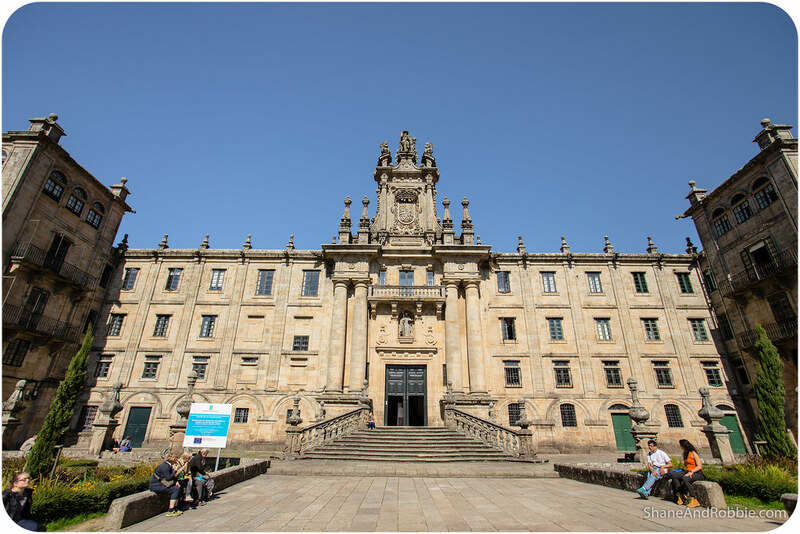 Originally the University of Santiago de Compostela was housed in this one, 16th century building; today the university is one of the largest in the country (which is, no doubt, another reason why Santiago de Compostela is awash with young people and has such as vibrant atmosphere). 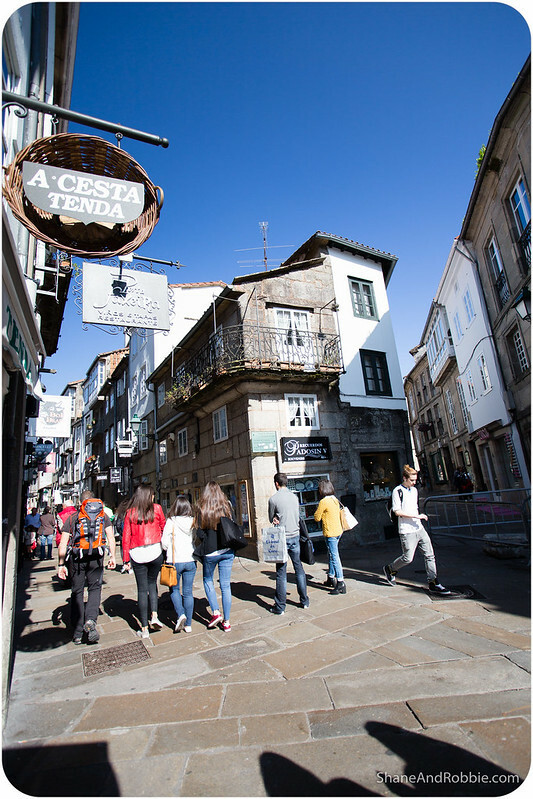 After exploring the sights around Praza do Obradoiro we proceeded to wander the streets of Santiago de Compostela’s old town, stopping to admire all the old buildings and losing ourselves in the town’s narrow streets. 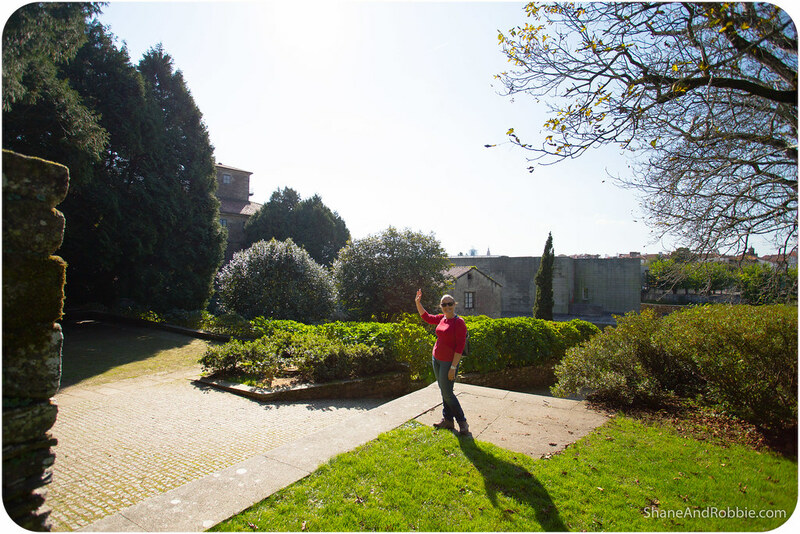 Just outside the old city walls we stopped at the Museum of the Galician People to learn a little more about the Celtic inhabitants of this region. Housed in what was once the Bishop’s Palace, the museum was interesting enough, but its gardens were better. 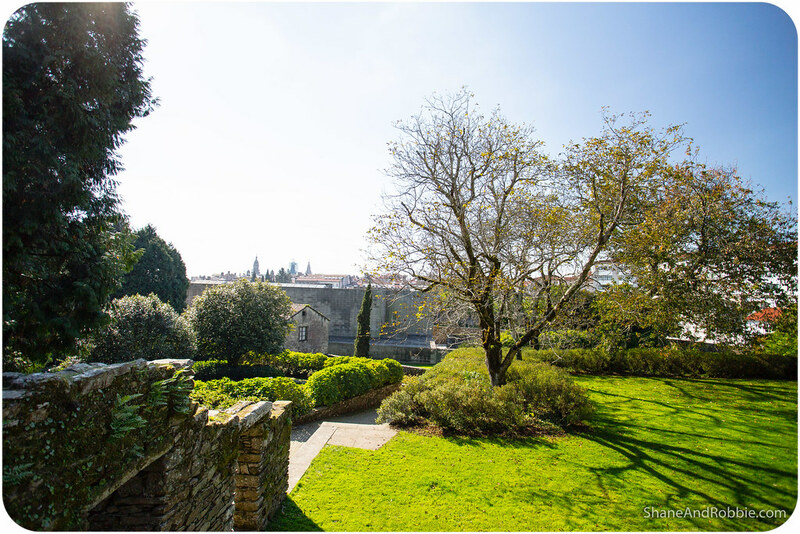 It was nice being able to stroll through what was once the Bishop’s private garden (now a public park), enjoying views over the old town along the way. 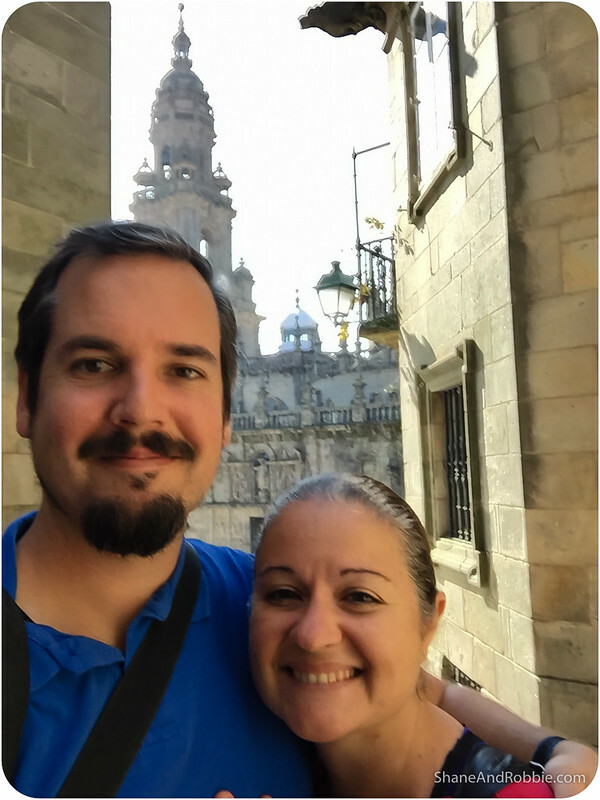 It’s been interesting making our way across the North of Spain, following the Camino route from Pamplona, across to Burgos, Leon, Astorga, Ponferrada, and now Santiago de Compostela. 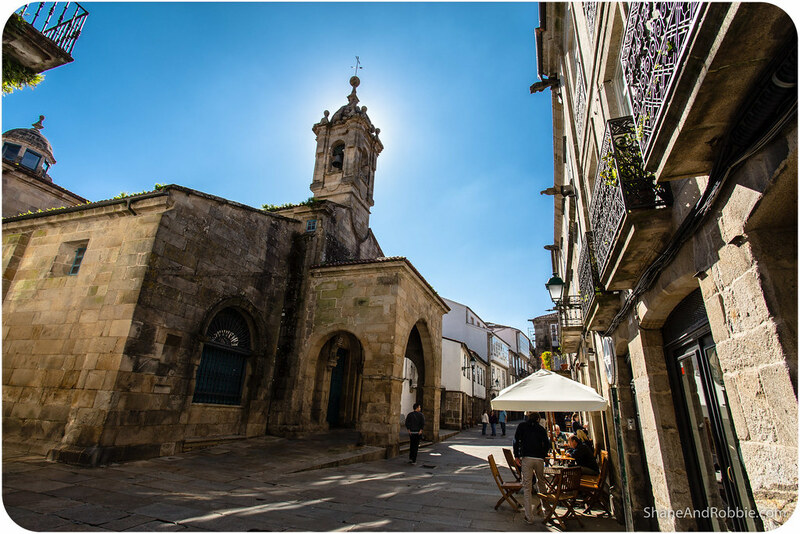 There are obviously similarities between these towns, but each has also had something unique of its own to offer. The landscape has been pretty (most of the time – the plains of La Meseta were a bit boring at times); the food good (if a little fatty and rich for our tastes); and the people friendly and welcoming (very conservative and traditionalist though – we were a bit surprised by HOW traditionalist people in this part of Spain are). 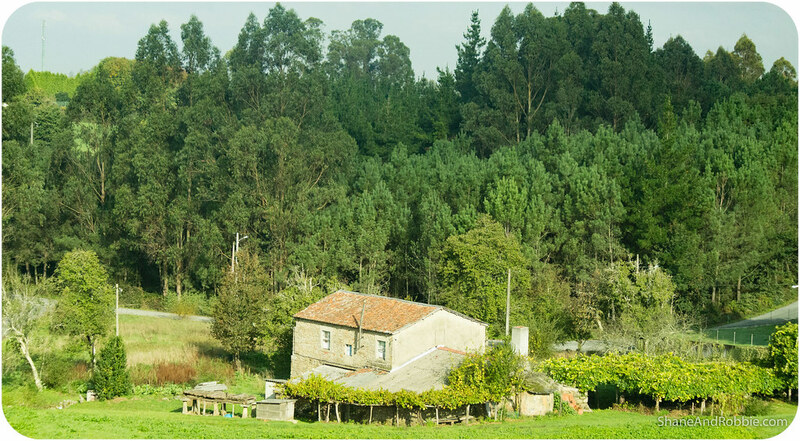 All-in-all though our visit through the Northern part of Spain hasn’t inspired us to do our own Camino. 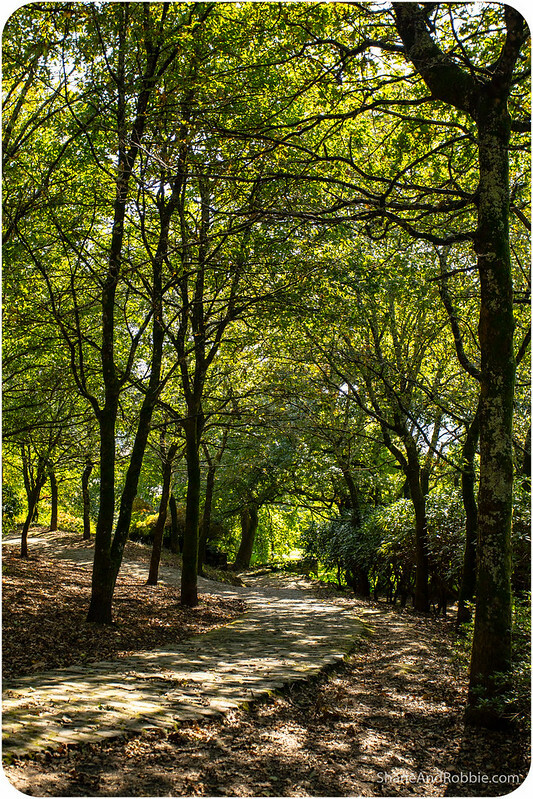 Certainly if there comes a time when we’re seeking a path to insight and introspection, a “walking meditation” like the Camino would be great, but not in Spain. 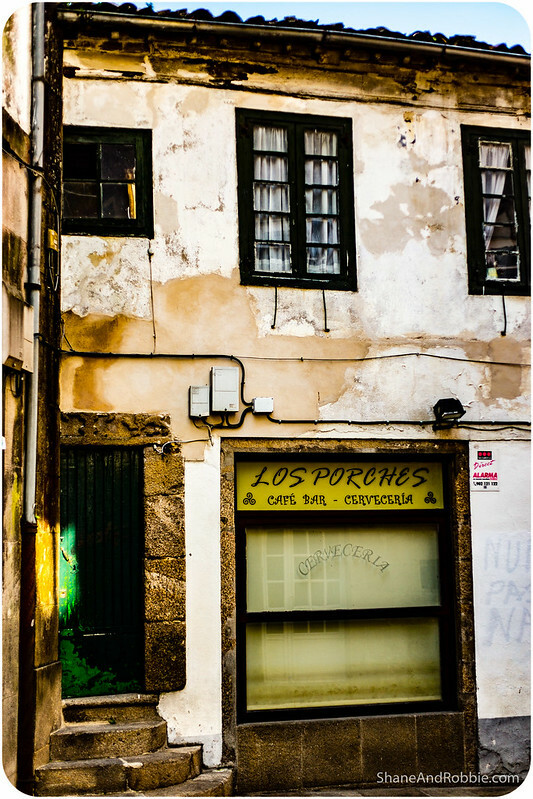 In all honesty something about Spain just doesn’t 100% gel for us – we’ve been here 2 weeks and we’ve tried repeatedly to figure out why we just don’t LOVE it here (we LIKE it here, but we just don’t LOVE it). 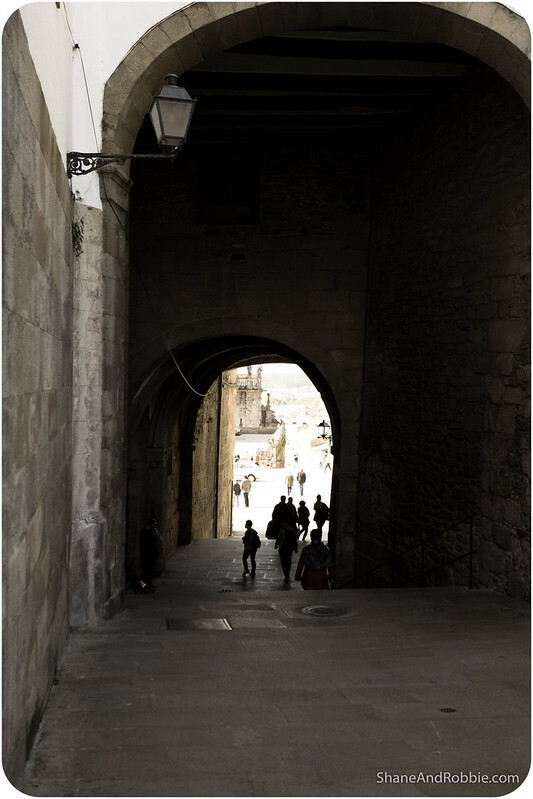 It’s most likely a combination of a whole lot of small things, but overall we haven’t been captured and entranced by Spain like we were by countries like France, Italy, Scotland, Ireland, Japan, Iceland, etc. It will be interesting to see how Portugal compares (we cross the border tomorrow and will be in Portuguese territory for about 2 weeks).